a certain beet-hating dining partner of mine was flattened by some sort of toxic, stomach-crunching illness over the weekend. i took advantage of the opportunity and made a big vat of beet borscht ("New York Deli Style," according to the Joy of Cooking, with some slight changes: broth instead of water, onion instead of garlic). i was naturally heartsick over the absence of my usual dining companion, but, I tell ya, that soup was good. how can so many people hate the beet? it's delicious, filling (amazing that one bowl with a scoop of plain yogurt can serve as an entire meal), pleasing to the eye and did i mention that it's delicious? even my cat likes borscht and he's allegedly a carnivore. not to mention how very simple this soup is: grate in your fancy, new food processor: a bunch of beets, an onion, a few carrots. put in a pot and cover with broth. bring to a boil and simmer until the veggies are tender. salt and pepper to taste, garnish with plain yogurt or sour cream and enjoy. if you have beet greens, you can mix those in, too. i'm sure they're a wholesome healthy addition. if you have it, a thick slice of pumpernickel is a lovely addition. My mom adds the juice from a jar of dill pickles. Yum! 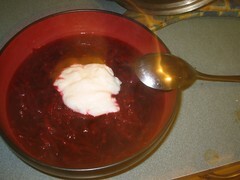 We used to make borscht at my restaurant. I was not familiar with it until then. Now the beet is one of my favorites.